← 24 Hours Ago, I had No Plans. Now I’m Halfway Across the World. In India, I learned that women, cleanliness, safety, and medicine rank low on the totem pole. In Thailand, I learned that new food prep, innovation, internet usage, and sleeping past 6 AM are frowned upon. In Kauai, Hawaii, I learned that people move to this island in particular to set up shanty towns in the wild and become live-off-the-land tax evaders. So now that you’ve been given a hint, what do naked people, money, beaches, and crazy destinations have in common with each other? Atlantic City. But why would I ruin a perfectly good post to talk about such a God-forsaken place? My whole point of moving temporarily to Hawaii was to one day hang out of a helicopter and take photos over the Na Pali coast. But since that seemed unlikely, hiking the coast seemed a very good second best. However, the photography job I was offered was on the Big Island. No biggie, since that was my second-choice island! Almost the size of Connecticut and full of snow-capped peaks, volcanoes, rainforests, and beaches, I never ran out of things to do outdoors. 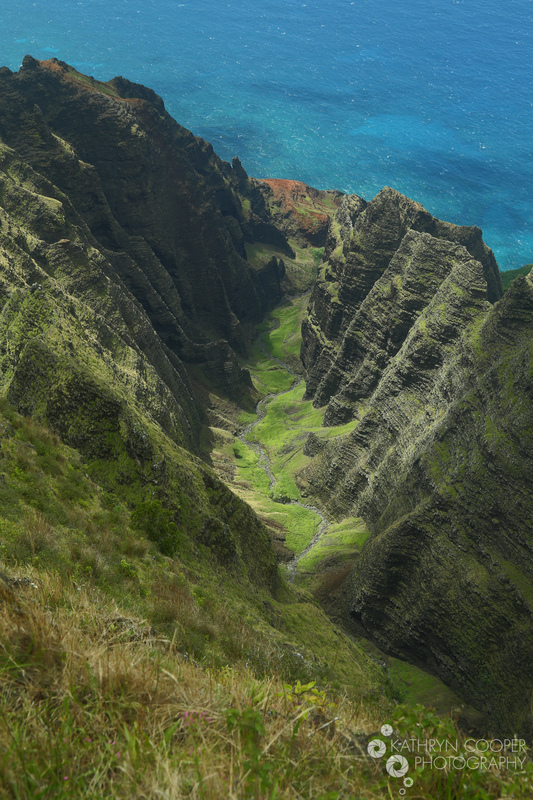 But then I was invited to hike Kauai’s Na Pali coastal trail—the Kalalau Trail—and I knew I couldn’t pass it up. So off my friend Brett and I went to this small but most delightful island, full of beautiful natural wonder, birds I’d never seen, and…traffic. I mean, there’s basically only one road and way too many tourists trying to polish off their cancer-ready tans. So the morning after landing, we tried to get away from the crowds and thus started out on 10 miles of “practice” hikes. No, I did not make that trail name up. 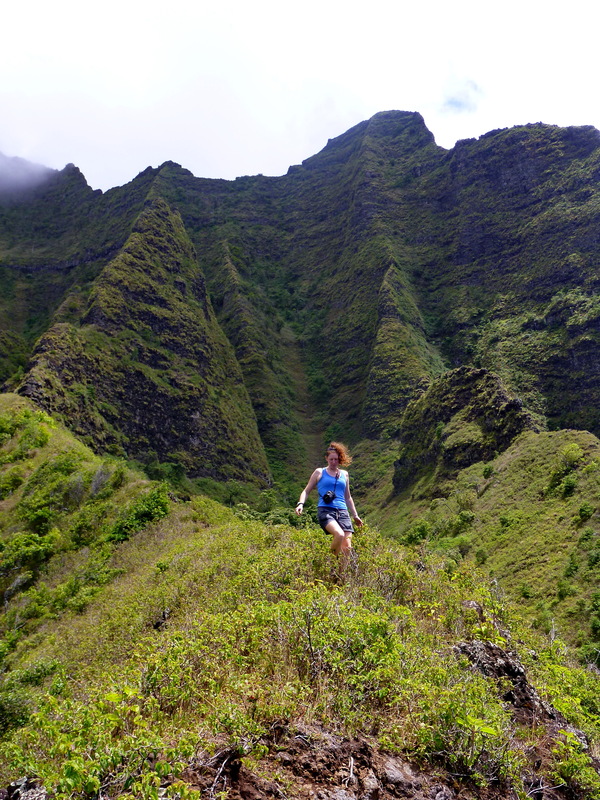 Then the main, 3-day Kalalau Trail blew my mind. Here’s why. After that, the other trails didn’t blow my mind. But there WERE free wild mangoes littering some of them, so I kept stopping to messily snack like a little kid. We then ate lunch, had shave ice, and sadly departed. 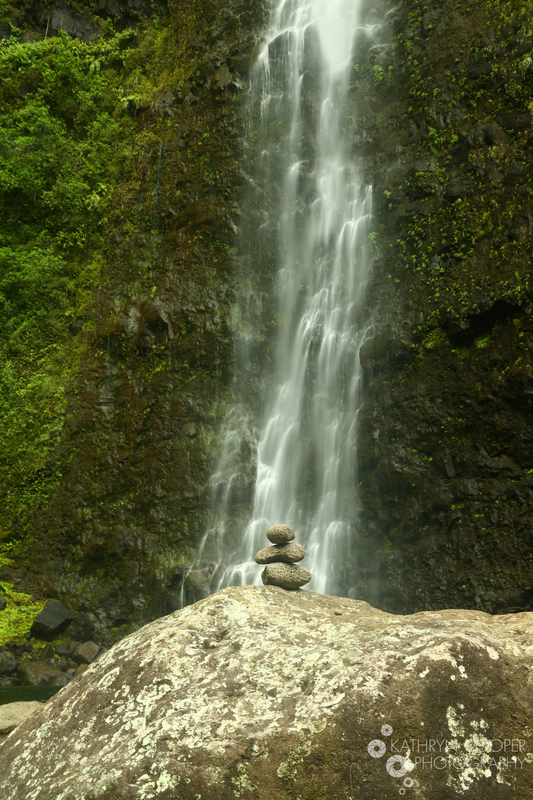 The Big Island has so much to do, but Kauai’s wildly unique beauty captured my imagination. Plus, where else would I, should the urge to do yoga or do it naked ever arise, have such an amazing view? Ehhh, I’ve hiked in better places. 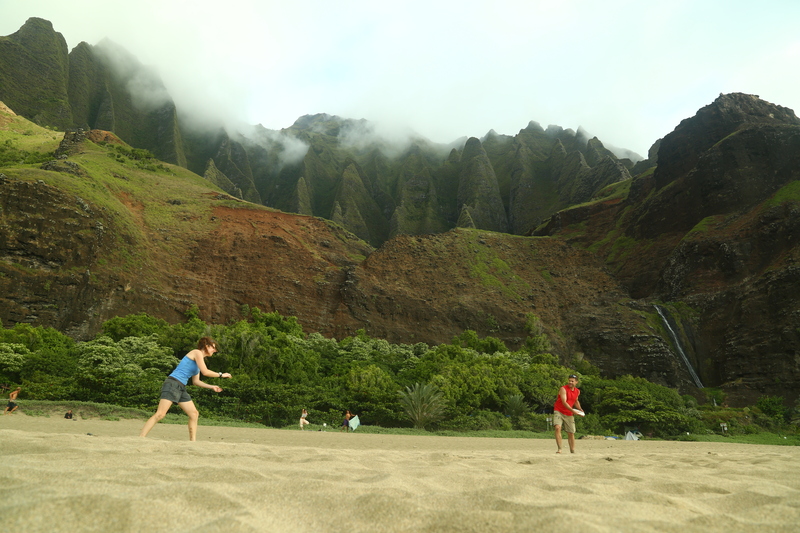 Ehhh, I’ve played frisbee in prettier places. There were indeed many, uhhh, modern-day hermits living in unexpected places, hobbit-like folks hiking the trail bare-footed, and almost no “normal” campers who had planned ahead, bought permits, and expected to enjoy the views with, I dunno, law-abiding citizens who were aware their social security cards were indeed still in existence? But despite odd people and too many of them in the most random places, for the most part we enjoyed hours of trail sections without internet, without cell service, and without people. We had a 1,500-foot waterfall to ourselves, saw dolphins and mountain goats, and just enjoyed what has to be the prettiest hike of my entire life. There were so many cliffs and awesome areas (like the not-aptly-named Crawler’s Ledge, which sounds dangerous but really isn’t) that would give any mother a heart attack. Though the elevation gain wasn’t big at all as a whole, the change in scenery and hot sun on exposed rock made 40 miles in 4 days tough! I sure felt healthy afterwards, a feeling which was quickly erased during our post-hike milkshake-and-burger celebration. We hiked more the next day, saw a lighthouse, overate, and wished there was more time to stay in the wild. Did you learn something new today? I sure did. I’d go back to Kauai in a heartbeat, though I don’t think I’m prepared to see so many old naked practitioners again just yet. Until next time, dear Kauai. Though watermarks were put on the photos I took, none of the photos in this post were edited in any way, shape, or form. 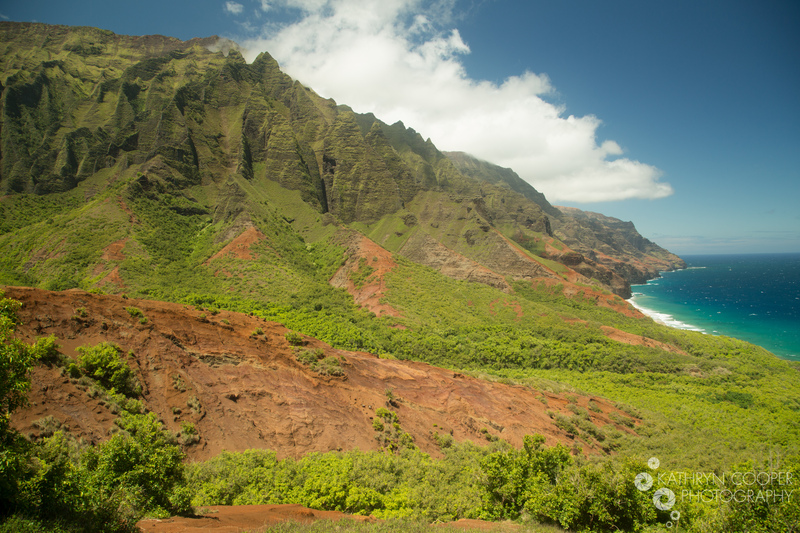 This is Hawaii shown in its unadulterated natural beauty! This entry was tagged anti tourism, awa'awapuhi hike, Awaawapuhi trail, awesome hawaii, best waterfalls in kauai, camping on the kalalau trail kauai, canyon trail kauai, hawaii cliffs, hidden hawaii, hiking hawaii, hiking in kauai, kalalau trail hiking, Kathryn Cooper, Kathryn Cooper photography, na pali coast hike, na pali hermits, photography kauai, view from the na pali coast, Waimea canyon hike, waterfalls kauai. Bookmark the permalink. I can see how this hike would blow your mind! Absolutely stunning! Great photography too! Thanks, Sarah! It was far more amazing than a few photos can explain. Such panoramic natural beauty!